When it's time for a new look, opt for this stunning bed. With contemporary styling and a bold color finish, the options of mixing and matching this piece is endless! Featuring an arched panel headboard and carved wood detailing, the bed structure is completed with a low profile footboard. For a no-fail finish, pair this piece with the coordinating case goods for a unique bedroom update. 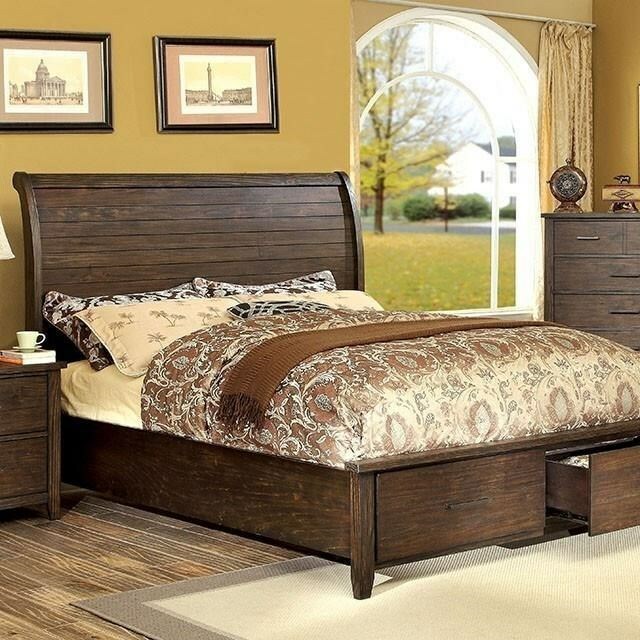 The Ribeira Rustic King Bed with Footboard Storage Drawers by Furniture of America at Furniture Superstore - NM in the Albuquerque, Los Ranchos De Albuquerque, Rio Rancho, Santa Fe, Corrales, NM area. Product availability may vary. Contact us for the most current availability on this product. CM7252EK-FB Footboard Component 1 0" 0" 0"
CM7252EK-HB Headboard Component 1 0" 0" 0"
CM7252EK-R Eastern King Rails 1 0" 0" 0"
Browse other items in the Ribeira collection from Furniture Superstore - NM in the Albuquerque, Los Ranchos De Albuquerque, Rio Rancho, Santa Fe, Corrales, NM area.